This will surely make your photos more interesting. It doesn't look like Instagram will stop lifting features from Snapchat anytime soon. Today it's the addition of stickers in Instagram Stories (a feature which itself was a direct Snapchat copy) on iOS and Android. 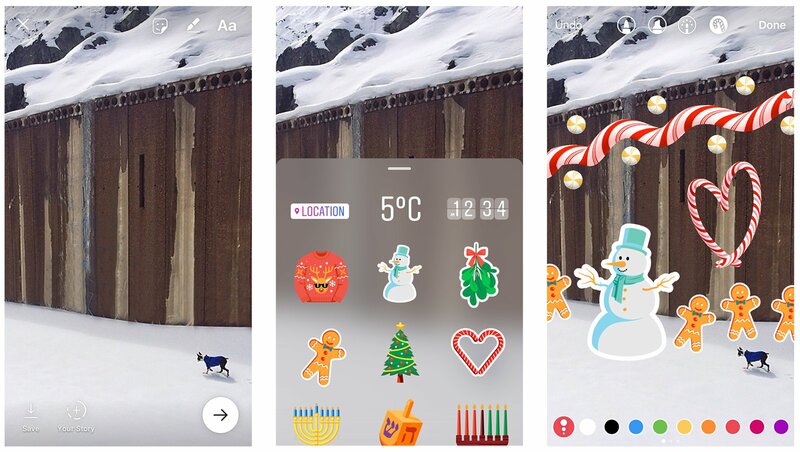 You'll be able to add stickers for things like the weather, your current location and the time in photos and videos that appear in your story. Yes, it's not exactly groundbreaking stuff, but it's the sort of fun and irreverent thing that's made Snapchat more appealing to younger folks. Instagram (and Facebook) just want in on that action. If you're not excited by stickers, there are a few other Instagram Stories updates that could be useful. You can now shoot "hands-free" videos just by tapping on the screen, add as much text as you'd like and save stories from the past day as a video. And of course, there's the expected holiday cheer in the form a candy cane brush and special stickers (with more on the way for New Years). While it makes sense for Instagram to play catchup with Snapchat, it would also be nice to see it innovating a bit when it comes to new features. Its new livestreaming capability, for example, is a sort of hybrid between Facebook Live and Snapchat. It's not entirely new, but at least it's distinctive.